Are you living life day to day waiting to see what life brings you… or are you living life looking to seize the moment? Don’t sit back and wait and hope for success… learn to Win on Purpose! So many people I come across have a victim mentality. I hear nothing good happens to me, I can’t do that, that’s not possible for me. Well if that’s what you think then that’s what most likely will happen. But for those of you who want to take your life to the next level, this program will help you go from a victim to a victor! “A wise man will make more opportunities than he finds." 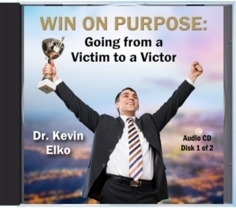 In this program, receiving victory in our lives is explained by living on purpose. Inside your heart is a passion –if we look inside we will find it and then we can utilize it to serve others and make a difference. We can live our lives in such a way that our time spent is purposeful service to others. But what robs many of living purposeful is a victim mentality. When we are spending our time thinking in ways that takes our energy there is none left to do the impactful things we can do. In addition to helping one find their passion this program teaches how to live with a victor mentality as opposed to a victim mentality. This program will help you live a life of vision and victory. This program is available in either an Audio CD (two Audio CD’s) format or a Digital Download (12 MP3 audio files) format. Click the individual link below to order your desired format. Click below to order the audio program in Digital Download Format (12 MP3 files in Zip File Format). You will immediately be directed to the download link where you can download your audio program.